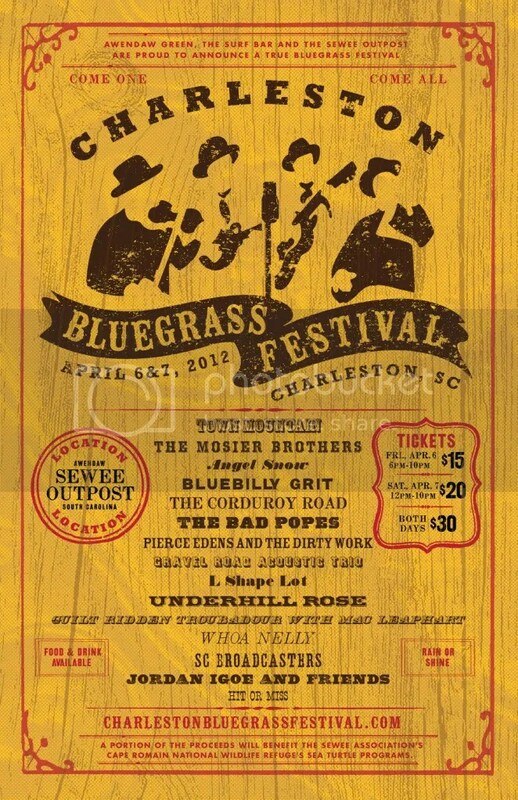 Awendaw Green and Sewee Outpost present the 2018 Charleston Bluegrass Festival on March 30 and 31 in Awendaw, SC. It will be a family friendly Lowcountry camping event featuring two side by side stages of local, regional, and national bluegrass with a special Saturday square dance set. Asheville’s Town Mountain, Kentucky’s The Wooks and Nashville’s Luke Bulla and Jenni Lyn headline the weekend. The Hungry Monks will host a Fire Ant stage alive with music for all ages as well as featuring a fiddle contest. There will be a diverse selection of food options from by Holy City Popcorn Company, The Roost Bar ‘N Grille, El Pinchotaco LLC, Damiano’s Wood Fired Pizza and Trolly Dolly Treats. A varied selection of local Craft Beer by Tradesman Brewing Co., Freehouse Brewery, COAST Brewing Company, Low Tide Brewing and Ship’s Wheel Hard Cider. Sponsors include The Bridge 105.5, Gil Shuler Graphic Design, Hungry Monk Music, and Christopher Kauker-Ameriprise Finincial Services. Daily ($15-25), weekend ($35-$50), and camping ($20-$100) tickets are available. This is a rain or shine event with no outside alcohol and dogs are allowed on a leash. For more information and ticket links at www.awendawgreen.com.